For continuous heating up to 3500C. The body is made of specially designed perforated P.C.R.C. sheet painted with attractive stove enamel with insulated elements. 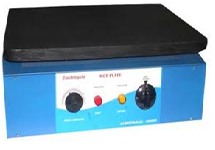 To work on 220/230 volts AC For continuous heating upto 350°C The body is made of specially designed perforated P.C.R.C sheet painted with attractive stove enamel with insulated elements. To work on 220/230 volts A.C. The body is made of P.C.R.C. sheet duly painted with attractive stove enamel. 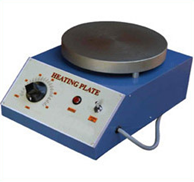 The top cast iron heating plate is round having 20cm (8") dia with heating elements of 1.5KW rating. Temperature is controlled by energy regulator upto 350°C. 1. Single plate with energy regulator. 2. Double plate with individual energy regulators. 3. Single plate with coil.